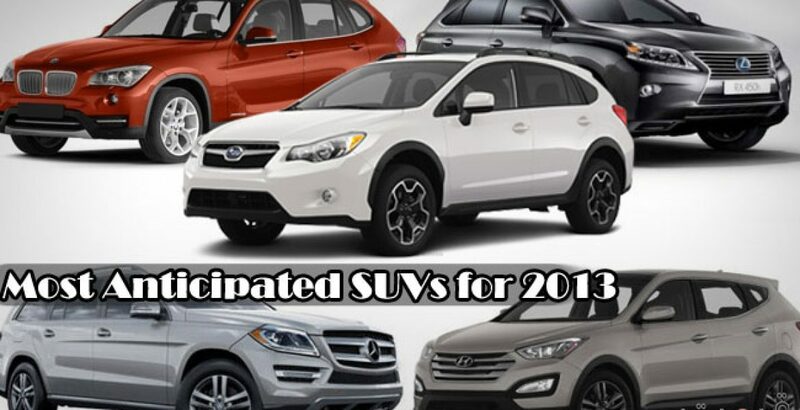 Here goes our most anticipated SUV’s list for 2013. The SUV market is a growing sector and every firm is battling to take edge over the others, hence SUV’s competition is getting tighter. The scenario was different in the previous ages where we had car models more than SUV’s and only few automakers were making SUV’s. Most of the car firms will be shifting to green technologies in 2013. We have been always waiting for X1 since it was first shown as a concept model at Paris Auto Show in 2008. X1 had made its way to be the first subcompact SUV vehicle released by BMW for 2013 model. Being successful in all Europe, X1 will hit the global markets in 2013 with a price starting from $31,545. Upon a quick look, X1 shares style and detail with predecessor X3 but with fresher look. The kidney grilled fenders and sleek look all make the heart drive to subcompact BMW X1. So what choices come under the hood? You can either make it up with turbo charged 30 Liter 3.0-hp inline 6-cylinder engine or with 240-hp 2.0-liter inline 4-cylinder engine, both versions offer all-wheel drive. Another long-gossiped SUV expands the list of Subaru range with new 2013 Subaru XV Crosstrek. Appearing under 2011 Forester, the latest XV Crosstrek is five-door vehicle featuring hatchback door built on 103.7 inches wheelbase. For engine you may be disappointed not having multiple choices. For now, just one engine available with five-gear manual transmission in all standard models. The foreseen SUV for 2013 also combines standard all-wheel drive in all XVs. Pricing is yet to be released as the arrival makes the way to global sales. Santa Fe contributes a big share in the success story for Hyundai. As a third-generation of Hyundai Santa Fe, the automaker is coming up with a complete reinvention. The Santa Fe Sport will replace the whole Hyundai Santa Fe lineup. Coming in three power-boosted engines, you can buy the version that suits your preferences. You have choices whether to fit 2.4-liter inline 4-cylinder (190 hp/181 lb-ft of torque) or a 2.0-liter turbocharged inline 4-cylinder (264 hp/269 lb-ft of torque). The Santa Fe built with 3.3-liter V6 with direct injection (290 hp/r252 lb-ft of torque). All versions offer 6-speed manual automatic transmission with choice to have standard front-wheel drive or all-wheel xDrive. Combining the basics of minivan and luxury SUV, you may feel a bit odd to be seen driving in RX 350 F SPORT as a family man. Although, it has all the essentials of a luxury drive, the serious concern is with the image. The new RX will expand the list of third-generation Lexus RX which was first introduced in 2010. According to car maker, the new RX will share exceptional design and performance. Built with 3.5-liter V6 plus an 8-speed automatic transmission, all-wheel drive has been kept as standard in RX 350 F Sport. Awaited to be seen in the start of 2013, the upcoming SUV is yet to disclose the pricing. Mercedes Benz gave a makeover to its three SUVs for 2013: GL-Class, GLK-Class and GL-Class. The GL-Class makes its way to our most anticipated SUVs for 2013 because manufacturer gave it a label: “the leading luxury full-size SUV”. The GL-Class offers three versions for 2013: GL350 BlueTEC, which gets a 3.0-liter V6 turbodiesel (240 hp/455 lb-ft of torque), GL450 built with 4.7-liter gasoline V8 turbo and GL550. which shares the same V8 charged to generate 429 hp and 516 lb-ft of torque. All of them are coupled with 7-speed automatic transmission.